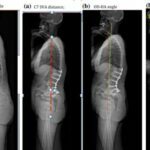 "To evaluate postoperative changes within the cervical alignment following surgicallumbar correction by pedicle subtraction osteotomy (PSO) in patients afected with sagittal global malalignment disease." (Surgeons look at abnormal . . .